We believe that a healthy pet starts with the right food. We are serious about where we source the foods that we carry. The mass pet food market is troublesome. Knowing where your food is coming from, how it's produced, and whether it's healthy can be difficult to navigate. We are passionate about finding the right food for your dog, so come in and talk to us! Just by changing food we have seen remarkable differences in dogs who have suffered from allergies, rashes, intestinal inflammation, weight gain, chronic yeast infections, and overall malaise! 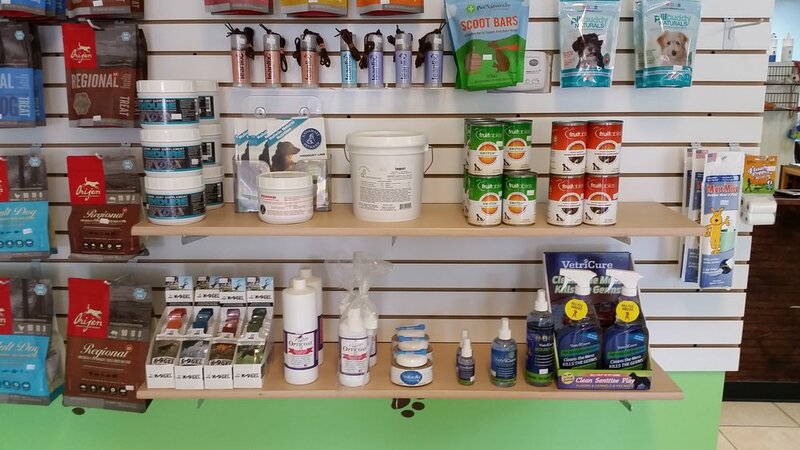 We carry raw, dry, dehydrated, grain, grain-free, canned foods, supplements, and treats for puppies, kittens, dogs, and cats. There is a good meal waiting for your pet, so come in and let us help you find it! Don't see what you need? We have many other foods available on special order, just ask!! Get an extra stamp on your self-service wash card when you buy any size bag of dog or cat food! All of the food companies we carry offer frequent feeder cards! When you come in for a bag ask us about discounts for yours!